Are you tired of cleaning out leaves and debris from your gutters? Call the professionals at Town & Country Seamless Gutters to avoid an unwanted mess in your gutters. With newly installed gutter guards, you'll protect your gutters from clogging throughout the year. You'll also keep them from getting damaged. From Leafproof® to all other brands of gutter guards, we have exactly what you need. 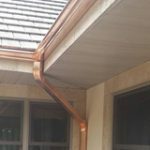 We can help keep your gutters clean with our gutter cleaning services as well. All of our workmanship is guaranteed.